Abdomninal hernias are common and palpation is sometimes inadequate for diagnosis. IMBUS can aid the diagnosis. 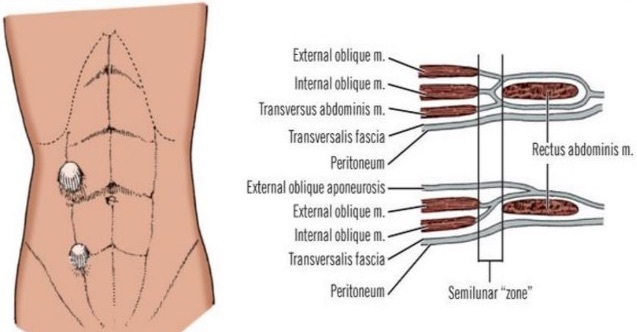 External abdominal wall hernias are frequent and represent one of the most common reasons for emergent surgery in patients over 50 years old. They are a protrusion, or bulging, of a structure through some part of the anterior abdominal wall. The protruding structure is most commonly fat, but can also be bowel. Hernias may occur only with increased intra-abdominal pressure and recede when the pressure returns to normal or they may persist. When a hernia is persistent at rest, but probe pressure moves the contents back into the abdomen, the hernia is reducible. If probe pressure does not fully reduce the hernia, it is called non-reducible or partially reducible. The term incarcerated should not be used. Strangulation is an appropriate term, but it is a clinical-pathological term that means tissue harm is occurring. IMBUS cannot reliably determine strangulation, although strangulated fat usually becomes more hyperechoic. Inguinal hernias are most common, followed by femoral, ventral (including Spigelian), and incisional. Incisional hernias will not be discussed in this chapter. Many hernias are asymptomatic and not every hernia needs to be fixed, so care is needed attributing symptoms to hernias. The linear probe is used with a musculoskeletal optimization. However, with very obese patients a curvilinear probe might be needed, although the lower frequency means that smaller hernias will probably be missed. The standing patient position may be necessary to visualize some hernias, so it makes sense to have this be the default position for fairly robust patients, using the same examiner and equipment positioning as used with the leg DVT exam. In more frail patients, the supine position is used. Intermittent patient Valsalva maneuver is almost always needed, although it is hard to standardize this maneuver. Coughing is a poor method, particularly for the IMBUS exam. “Hold your breath and strain like you are lifting something heavy” is an instruction that can work. “Push down (bear down) like you are trying to move your bowels” isn’t quite as good, particularly if the patient passes gas. Anatomy knowledge and a systematic approach are required to evaluate patients with lower abdominal pain or bulges. 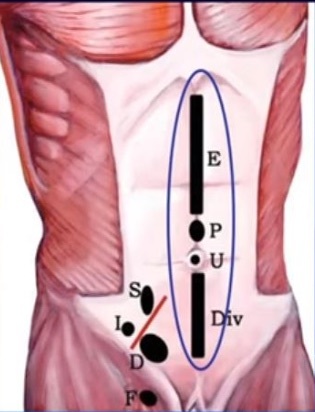 Even in a patient with no midline pain or bulge, beginning in the midline just below the umbilicus helps get the depth and gain correct for a patient and starts the anatomic survey. These hernias, more common in women than men, occur anywhere in the midline through a defect in the linea alba. The following diagram shows the locations of what would be called epigastric, paraumbilical, umbilical, and hypogastric ventral hernias. Here is a clip of a normal midline in a lean, younger patient showing the rectus muscles, the linea alba, and the peritoneal line, below which bowel can be seen moving. Diastasis recti is a common condition that suggests a ventral hernia, but rarely needs repair. It is a widening of the central gap between the rectus muscles. When a patient raises her head or does a partial sit up, there is a midline bulge. However, while the linea alba and the intra-abdominal contents bulge upwards, there is no defect in the linea alba or the peritoneum. 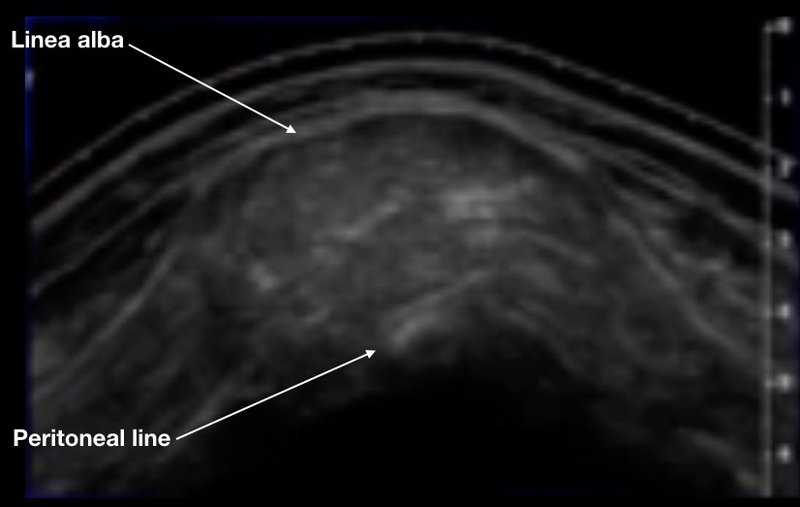 The following image shows a bulging diastasis recti with the rectus muscles spread far enough part that they are barely in the image. The earliest form of a true ventral hernia is a “pre-peritoneal” hernia. 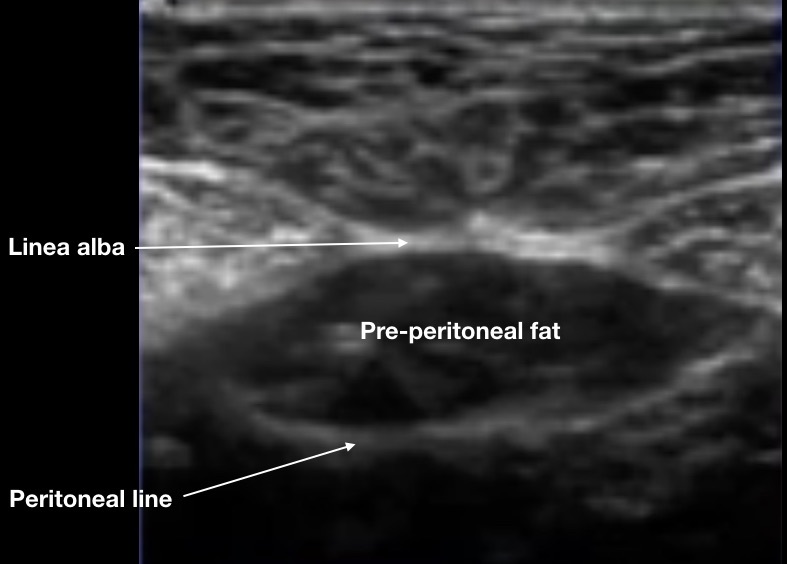 Some patients have a collection of fat between the linea alba and the peritoneal lining, as shown in the following image. When a defect occurs in the linea alba, this pre-peritoneal fat can be the first thing to bulge up, causing the patient to feel a lump. Yet, the peritoneal lining is still intact so abdominal contents are not in the hernia. Here is a still image of a pre-peritoneal ventral hernia with Valsalva. The next clinic patient had midline symptoms, but the surgeon’s exam was equivocal. Fat is seen coming up through the linea alba but the peritoneal line is mostly intact, so this is mostly a preperitoneal hernia that is not ready for surgery. The following image was taken with a transverse probe position just above the umbilicus in an older man. The two rectus muscles are noted with an “R”. The green arrow points to the linea alba defect and the white arrow points to the abdominal contents (mostly fat) coming up as a bulge. Eventually, ventral hernias can become large, contain fat and bowel, be non-reducible, and strangulate. The next clip shows a non-reducible paraumbilical hernia, still containing mostly fat. The two white arrows note the wide neck of this hernia, which makes it less likely to strangulate than a narrow-necked hernia. An important anatomic landmark for the next three hernias is the inferior epigastric artery seen initially on the posterior margin of the rectus muscle. Slide the probe to center a rectus muscle on the screen. There is usually one small artery and two small veins close together on the posterior border of the muscle. The low default Nyquist limits with most musculoskeletal settings give prominent motion artifact of the abdominal wall and of the intestines. Have the patient stop breathing for a handful of seconds to quiet the abdominal wall movement. The following clip with color flow Doppler shows the small inferior epigastric bundle at the posterior margin of a right rectus muscle. The color Doppler artifact from bowel peristalsis remains. As the probe moves caudad on the rectus muscle, the inferior epigastric vessels move out to the lateral margin of the muscle to begin moving diagonally toward the iliac vessels. The next clip shows the epigastric vessels in a young, lean patient as they reached the lateral border of the right rectus. This location is a landmark for the semilunar zone, shown on the next diagram. This fascial region may be a weak point that allows a herniation, called a Spigelian hernia. A Spigelian hernia can cause pain/bulging at the lateral margin of a rectus muscle. These hernias rarely strangulate. When a patient has pain or a bulge near the lateral margin of a lower rectus muscle, find the inferior epigastric vessels at the lateral rectus muscle and have the patient perform a Valsalva maneuver. A dynamic hernia may be seen lateral to the vessels as in the following image. The inguinal ligament is a modestly hyperechoic, fibrous band running from the anterior superior iliac spine to the pubic tubercle. Indirect inguinal hernias, the most common hernia in males, begin inside the abdomen just cephalad of the midpoint of the inguinal ligament. The inguinal canal is the tunnel through which the fetal testicle descends out of the abdomen into the scrotum. The following diagram shows a lateral view of the lower abdomen with a fetal testicle in transit from inside the abdomen to the scrotum. Once the testicle has descended, the spermatic cord trails back through the inguinal canal and connects to the seminal vesicle next to the prostate in the retroperitoneum. If the inguinal canal is larger than normal, it becomes a conduit for intra-abdominal contents, which is an indirect inguinal hernia. The right testicle usually descends later than the left testicle, which is blamed for right inguinal hernias being more common in males. Since the inguinal canal in females does not enlarge from the descent of a testicle, indirect inguinal hernias are rare. In a female, only the small round ligament of the uterus runs through the inguinal canal. 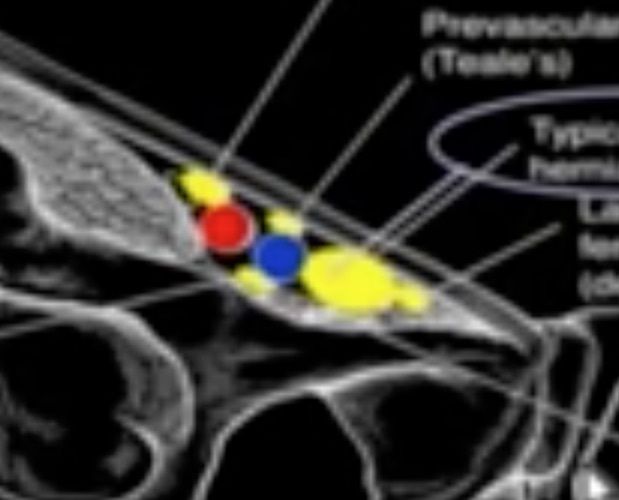 The next diagram shows the important anatomic landmarks from the front. The beginning of the inguinal canal is inside the abdomen at the deep ring, which is just lateral to where the inferior epigastric artery originates from the iliac artery. With indirect inguinal hernias, abdominal contents enter the deep ring and then run anterior to the inferior epigastric artery through the canal, almost parallel to the inguinal ligament. If an indirect inguinal hernia becomes large enough, the contents can fully traverse the canal, exit through the superficial inguinal ring near the pubic tubercle, and descend with the spermatic cord into the scrotum. Large indirect inguinal hernias are not a challenge to diagnose the traditional way, so IMBUS is important only for finding smaller, symptomatic hernias that are only part way into the inguinal canal. The IMBUS exam is focused above the inguinal ligament. Method: The probe is placed parallel to and just above the midpoint of the inguinal ligament. The inferior epigastric artery is then identified at its origin from the iliac artery, using color flow Doppler. The deep inguinal ring is lateral to the origin of the inferior epigastric artery. Next is a clip from a normal male showing the pulsating right inferior epigastric artery. The small hypoechoic area lateral to the inferior epigastric is the deep ring, which is often indistinct. Color flow Doppler distinguishes this hypoechoic area from a vessel. The more hyperechoic, linearly striated structure running anterior to the inferior epigastric artery is the spermatic cord. Once this region is identified, have the patient Valsalva and watch for contents to bulge anterior to the inferior epigastric artery. Because abdominal contents can shift during a Valsalva maneuver, it may occasionally be important to view the beginning portion of the inguinal canal both longitudinally and in cross section to confirm the presence/absence of a hernia. It is important to use light pressure or the probe may compress the inguinal canal and obscure a hernia. Next is a small right indirect inguinal hernia with a small amount of fat entering the canal anterior to the inferior epigastric artery. Here is a somewhat larger right indirect inguinal hernia with fat entering an inguinal canal containing fluid. Fluid is relatively common in the canal in patients with inguinal hernias. The hernia is sliding on top of the spermatic cord. There can also be cysts of the spermatic cord, but there would be no tissue sliding up the canal from the abdomen. Lipomas can also occur on the spermatic cord and might be confused with a hernia, except lipomas are in the canal without any tissue entering at the deep ring. 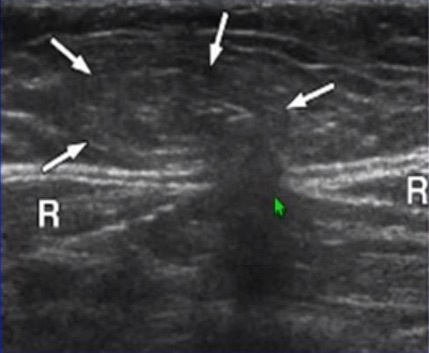 If a Valsalva maneuver shows no tissue entering at the deep ring, a lipoma could be suspected, but formal ultrasound would probably be needed for confirmation. These hernias, most frequent in older men, are initially a bulge, and then a defect in what is called the “conjoint tendon” (the joining of all the lateral abdominal muscles into one tendon at the caudal, medial abdomen). Direct inguinal hernias are less likely to strangulate compared to indirect inguinal hernias. When there is only a symptomatic bulging of the conjoint tendon, without a defect in the tissue, the term “sports hernia” is used. Traditionally, direct inguinal hernias are described as occurring in Hasselbach triangle, which is bounded by the rectus muscle, the inguinal ligament, and the inferior epigastric vessels. But, for the IMBUS exam, direct inguinal hernias arise medial to the inferior epigastric artery, compared to lateral for indirect inguinal hernias. Here is a diagram showing the area in which direct inguinal hernias develop. Direct inguinal hernias do not involve the inguinal canal, but bulge directly anterior through the lower abdominal wall. Thus, the probe is moved medial from the indirect hernia position and positioned transverse on the lower abdomen, positioning the inferior epigastric artery slightly lateral on the screen. Obviously, if a patient has specific pain or a bulge in this area, the probe will also be placed right in that location. A Valsalva maneuver will almost always be needed. Here is a relatively small fat-containing direct inguinal hernia bulging just medial of the right inferior epigastric artery. Next is a larger direct right inguinal hernia that was not completely reducible. Finally, here is a large direct inguinal hernia that was partially reducible, but bowel moved up into the hernia with Valsalva at the end of the clip. Femoral hernias are more common in women and increase with multiparity. These hernias can extend into the medial thigh, contain fat and/or bowel, and strangulate. The great majority of femoral hernias come through the femoral ring medial to the common femoral vein. This location is familiar because of IMBUS DVT exams. However, a femoral hernia can infrequently appear a little lateral or medial to this location, as in the following diagram (the yellow blobs). Find the common femoral vein above the junction of the great saphenous vein. The area medial to the common femoral vein normally contains lymph nodes, connective tissue, and fat. A Valsalva maneuver is needed to see the moving hernia. Here is a very small femoral hernia appearing anterior and slightly medial to the right common femoral vein. 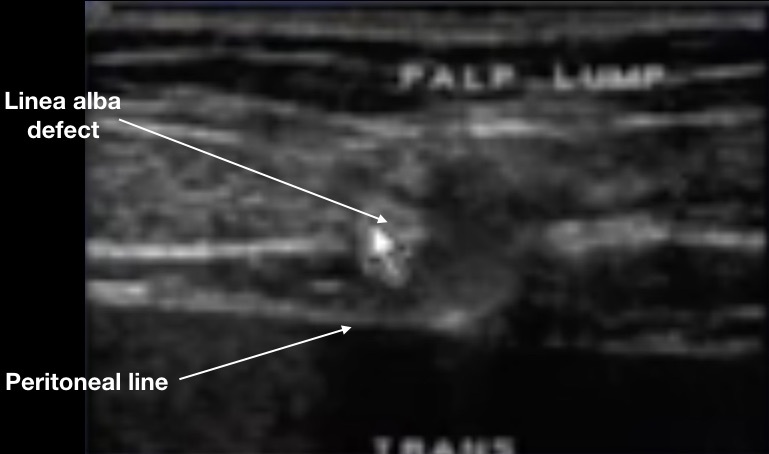 This last clip has the right common femoral vein at the left edge of the screen (the white arrow pointing up). The arrow from the top is pointing to a femoral hernia which is only partly reducible and then enlarges with bowel after a Valsalva. Sometimes, a parasagittal probe position can help confirm a femoral hernia descending from above because of the longitudinal orientation on the hernia sack.